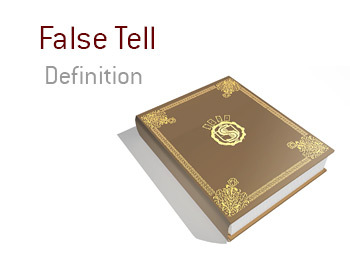 What is the definition of the term "false tell" in the game of poker? What is meant by a false tell? In poker, a "tell" is some involuntary action that sheds light as to the strength of your holding. For instance, if a player has a weak hand, they might involuntarily start tapping their neck while they think, or perhaps they might place their chips into the middle of the table in a different manner compared to when they have a strong holding. The "false tell", or "reverse tell" as it is sometimes called, occurs when a person tries to deliberately mislead the other players at the table by putting on an act. For instance, a person with the nuts may try to act weak by purposely breathing more heavily or perhaps shaking their head while looking at their cards. This type of "false tell" is usually sniffed out pretty easily by more experienced players, as it tends to be the amateur players who put on big acts when they have big hands. In fact, many amateurs will completely give away the strength of their hands when they try to put out "false tells", thus defeating the purchase completely.